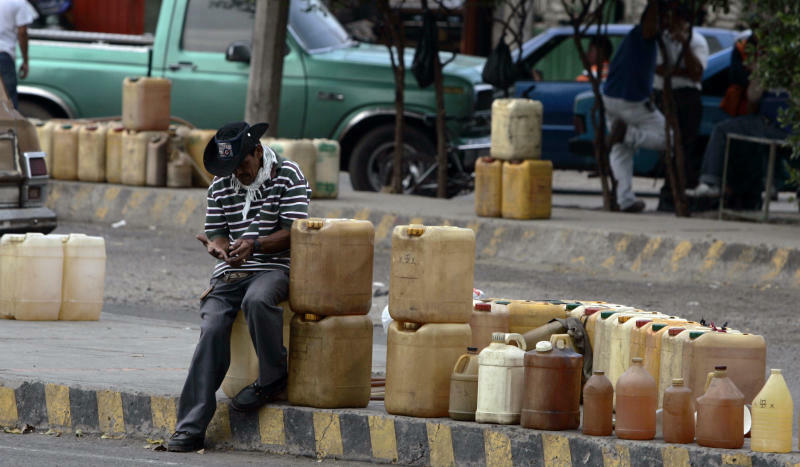 CARACAS, Venezuela (AP) — As home to the world's cheapest gasoline, Venezuela has long had to contend with the hemorrhaging of supplies as smugglers haul gas across the border to cash in where the fuel costs far more. So much gasoline is being taken out of Venezuela illegally that President Hugo Chavez's socialist government imposed rationing on motorists in one state bordering Colombia last year, and now it's touched off a furor in a second border state by announcing it will ration gasoline there, too. "We transport workers are not to blame for this scourge," said Olivio Fernandez, a bus driver in Maracaibo, which is Venezuela's second-largest city with 2 million inhabitants. It's also the capital of Zulia state, where the expanded rationing is planned and where Chavez planned a Saturday visit for his re-election campaign. Drivers will have microchip-embedded stickers affixed to their windshields to regulate purchases, just as motorists have been required to do in neighboring Tachira state for the past year. Rationing in Tachira, home of the busiest Colombia-Venezuela border crossing, varies with a motor vehicle's size, location and use. Private automobiles in the border town of San Cristobal are limited to buying no more than 42 liters (11 gallons) a day, for example, while buses are limited to 150 liters (40) gallons. Announced two weeks ago, Zulia's rationing was supposed to have gone into effect next month. But after heated criticism from local officials, the government decided to postpone the plan, saying it will start no later than August 2013 but suggesting it could be implemented before that. Oil analysts say the new rationing may indicate something graver than a contraband problem, noting the anger-inducing plan was announced in an opposition-dominated state just three months before the presidential election. The measure could mean that production and refining troubles are worsening in the less-than-transparent state-run petroleum industry, the analysts say. Venezuela is a major oil exporter but its refining capacity is limited, so the government buys gasoline from the United States, losing money by then selling it at home for almost nothing. Those imports have been steadily rising since 2009. In April, Venezuela imported 54,000 barrels a day of U.S.-refined gasoline, a 38 percent rise over the same month a year earlier, according to the U.S. Energy Information Administration. The Chavez government has not explained why the gasoline imports from the United States, the principal market for Venezuelan crude, continue to climb and the press office of state-owned oil company PDVSA did not respond to repeated requests by The Associated Press for an explanation. Ramon Espinasa, a Georgetown University economist, blames "operational problems" at some Venezuelan refineries as well as rising demand from power plants built in the past two years that burn gasoline and diesel fuel. "They're not producing specialized (petroleum) products and must import finished products," Espinasa said. Venezuela devoted 830,000 barrels of crude a day to its domestic market from April through June, the U.S. Energy Information Administration estimates. The Chavez government says it produces a total of 3 million barrels a day, but independent sources such as OPEC put Venezuela's output at 2.3 million barrels. Chavez made reference to the new rationing measures for Zulia, one of 24 Venezuelan states, in a campaign speech July 13, saying it is meant to prevent lines at gas stations. "It's not rationing," he said. "It's a means of control, to give everyone gasoline, because the gasoline here is practically free, so the idea is to give everyone what they need." Eight months ago, authorities imposed gas rationing in two Zulia towns on the border with Colombia's Guajira state, long a major waystation for all manner of smuggled goods from incoming cigarettes and liquor to outgoing cocaine. The rationing has cut into the earnings of local bus and taxi drivers, who are allowed to buy 100 liters (26 gallons) a day. The response has been a black market in which gasoline is sold by the side of the road in jerry cans for twice the regular price. The announcement that Maracaibo would be next prompted immediate rejection by the political opposition and transport unions. The opposition is demanding rationing be put to a referendum, and Chavez's presidential opponent, Henrique Capriles, says he'll abolish rationing if elected. "Zulia is the best state producer of oil in Venezuela and we don't understand why because of the government's shortcomings it gets the blame," said a state lawmaker, Eliseo Fermin. He said big-time smugglers are responsible for most of the contraband gasoline leaving the country. "It's a business that the armed forces permit," Fermin said. Venezuela's National Guard controls the borders and the political opposition accuses it of allowing tanker trucks full of gasoline into Colombia. Espinasa estimates as many as 100,000 barrels are smuggled out of Venezuela every day, representing a loss of some $5 billion a year. Only small-time smugglers are ever arrested. The editor of the Caracas opposition newspaper Tal Cual, Teodoro Petkoff, says the big smugglers aren't just using tanker trucks but also ships, ferrying the cut-rate gasoline to Caribbean islands. Venezuela's petroleum minister, Rafael Ramirez, traveled to Maracaibo this week to discuss the dispute but didn't back down, although he didn't give any details on what the daily per-vehicle limit would be or set any date for when rationing might take effect. He said the imposition of rationing in Tachira state and the two border towns in Zulia has cut gasoline smuggling by 56 million liters (15 million gallons) a month, saving the government about $400 million a year.